We have a holiday weekend coming up, so why not celebrate? Labor Day is coming up on September 4 and for many people that means the last big outing of the summer season. If you’re looking for a memorable way to cap off Summer 2017, there’s no better way to do it than with a NYC Skyline Cruise. Our 3-deck luxury yacht, the Skyline Princess, is the venue for public cruises which we hold every weekend. Whether it’s a lunch, brunch, dinner or holiday cruise, you’ll have an experience you’ll never forget on a Skyline Cruise. We want to tell you about our public cruises and why you should “Sail this Summer with Skyline,” even as the season ends. Labor Day, which is celebrated on the first Monday of September, “is a creation of the labor movement and is dedicated to the social and economic achievements of American workers,” according to the US Department of Labor website. For many, the weekend means fun with friends and relatives. Your meal will also come with roasted New Bliss potatoes, fresh steamed vegetables, dinner rolls, cash bar for alcoholic beverages, complimentary soda, juice, coffee, tea and water. You don’t have to have a particular reason to join our public cruises, but remember, the Skyline Princess is perfect for any occasion. If you’re planning a celebration you won’t find a better venue than Skyline. We host all types of events from weddings, Bar/Bat Mitzvahs, birthdays, Sweet 16 or Quinceañera celebrations, corporate meetings, fundraisers, and many more. For large events, we can do a full ship charter of the Skyline Princess. But we also can reserve a deck on our public cruises. Our most popular weddings are private decks on a dinner cruise. For smaller events we can reserve a table or two or even a celebration for just a few people. Skyline accommodates all types of groups with all types of budgets. It costs less than you think. If you have a need for your celebration, let us know. The third deck of the Skyline Princess, known as the Skylight Deck has a dance floor and a DJ so you can party under the Stars at your dinner cruise. One great feature of this deck is that it can be opened or enclosed. We sail year round and you never have to worry about the weather on a Skyline Cruise. Our Labor Day Weekend public dinner cruise will go up the East River to New York Harbor and back. 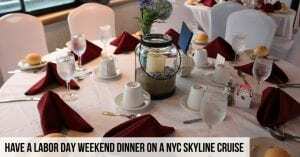 We also provide full ship private charters from many ports in NY, NJ, LI, Westchester, and CT. Skyline offers Long Island Sound charters from Port Washington, Westchester, and Connecticut. To book your cruise, contact us today.